In the market for real estate? Look no further than your local bank to find deals on the cheap. When the real estate bubble burst over five years ago, values dropped rapidly, often falling to values so low they defied even the most pessimistic world view. That was five years ago. The real estate market has improved quite a bit since then, but opportunities remain. If you're still looking for the real estate deal of a lifetime, the first place to look is still your local bank. That's right, the best place to find rock bottom prices five years after the real estate crisis is in bank owned property. 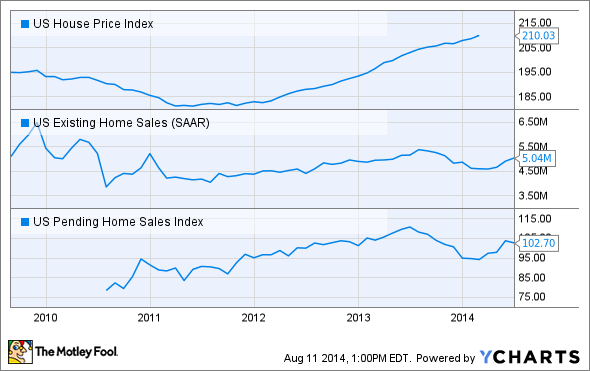 The entire real estate market has improved across the board -- from prices, to sales, and everywhere in between. The markets hit hardest in the crisis are now bouncing back the highest. But, fresh data from the banking industry clearly demonstrates that values can still be found investing in foreclosures. Every quarter, U.S. banks are required to file a financial report with regulators called the "call report." This report includes a full breakdown of the bank's income, expenses, profits, and its balance sheet. Because this call report is consistent at every single institution, we can aggregate all the data and get a very clear picture of the industry's condition as a whole. In the five or so years leading up to the real estate crisis, about 0.05% of total banking assets were bank owned property. At its peak in the third quarter of 2010 that number hit 0.40%, an eight fold increase. The data suggests that the rate of foreclosures is improving, -- it's more than halved since the peak in the third quarter of 2010 and declined by nearly 5% from Q1 to Q2 this year -- but the level of bank owned property remains extremely elevated from historical norms. Today's level of bank owned real estate is down to 0.18%, about 3-4 times historically normal levels. In raw dollars, that percentage translates to $27.9 billion of property. That's a lot of real estate for sale. Banks are not in the business of owning real estate. A bank's earning assets are loans or other interest generating assets. Bank owned real estate is an expense, not an earning asset. The buildings and improvements must be maintained, the grass must be cut, and property taxes must be paid. On top of that, banks are required to hold reserves on these assets, reserves that come directly out of bottom line profits. For some banks, these expenses can reach into the millions of dollars or more. Thinking about bank owned real estate in that context, not as an asset but as an expense, it's easy to see why banks would want to sell quickly and perhaps even at a discount. The faster the bank can rid itself of these properties, the faster it can improve profits and redeploy that money into incoming generating loans. It's a true win-win situation. Based on the data from the call reports, the best place to begin your search is at your local community bank in your city. The trend in the industry is for larger institutions to have lower levels of bank owned property than the smaller institutions. For example, banks with total assets between $5 billion-$49 billion have just 0.05% of total assets as bank owned property. Banks with total assets between just $100 million-$249 million have 13 times more at 0.66% of total assets. Perhaps even more importantly though, these local institutions will often be more willing to negotiate with you to lower the price or offer favorable financing to aid in your purchase. Don't think that just because the real estate crisis peaked over five years ago that deals are no longer out there. Because when it comes to bank owned property, deals are absolutely still available -- as long as you know where to look.